Ever since Google Street View was introduced, people have been spotting odd tidbits from daily life, from petty thieves, bike crashes, to questionable choices in underwear. Seeing as the Netherlands was only added to Street View this past March, I didn’t make much use of it. That changed a few weeks ago, when I found myself checking street view, so I could give an idea of what my new neighborhood is like to friends and family back in the US. 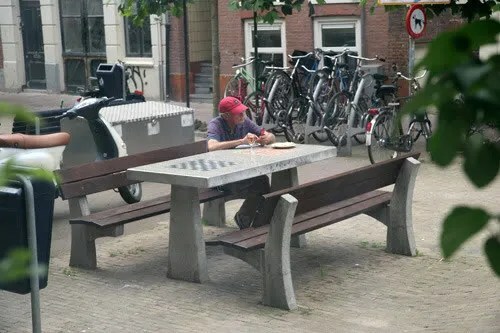 There’s a small square in front of my building, and on street view I noticed at a man with a red hat sitting at a table, right in front of my apartment. I didn’t think much of it at the time, yet after moving in to my new home, it only took 24 hours for me to realize that the man with a red hat is almost as much a part of the square as the picnic table. Google Street View captures the man with a red baseball cap. The man with the red baseball cap, captured on digital film, this afternoon.